Today, a post that has nothing to do with my game project. This small Jeep project is an exercise that I give to my second grade students @ HEAJ (Video Games Group). The project makes use of various techniques in order to achieve the best possible rendering of a CJ-7 Jeep on the PSP using FreshEngine. A second exercise will come later where this jeep is placed inside a small game level designed and created for this purpose. In a way, I think exercises like these also demonstrate how there is always untapped potential in a platform. That unfortunately is a reality of gaming hardware, they become obsolete before being pushed to their limit. Actually, I think there's no limit but the imagination. Look at some of the latest C64 demos (from Booze Design for instance) and how new creative techniques can make this 30 years old machine do things that we though would never be possible. One of the constraint was to make it fully functional for later use in an actual map. So movable parts had to be setup correctly and animation-ready. Also I asked for the engine to be modeled so that if we crash the jeep into an obstacle, the hood could be opened and the engine revealed. The bottom of the jeep also had to be rendered realistically. All had to be done within a 4500 triangle budget with as few UV splits as possible. On PSP, achieving nice environment reflections for the car paint and mirrors is challenging. One of the reason being that there is no real reflection mapping available in the hardware gpu. Instead it is capable of computing UV coordinates based on the result of lighting computations (shade mapping). So playing with bended normals and attaching shading lights to the camera can do the trick. 64x64 texels texture for environment, 512x512 texels texture for Jeep with alpha channel used as reflectivity mask for envmap. Both textures quantized to 8bits/texel. 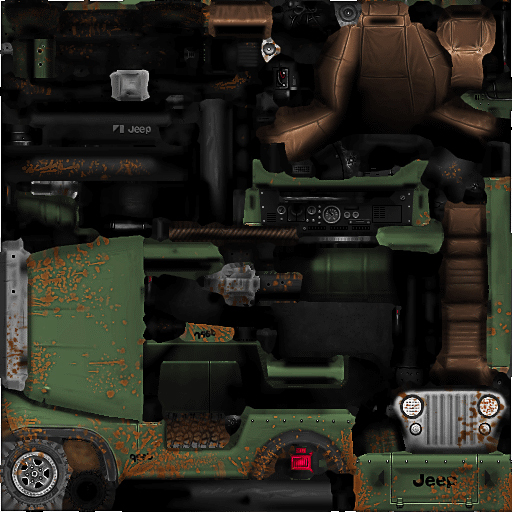 I could have ask to split the jeep into color matching parts and assign each part to a 4 bits texture (16 colors) for the most aggressive optimization, but I thought it would be too much for them to handle. 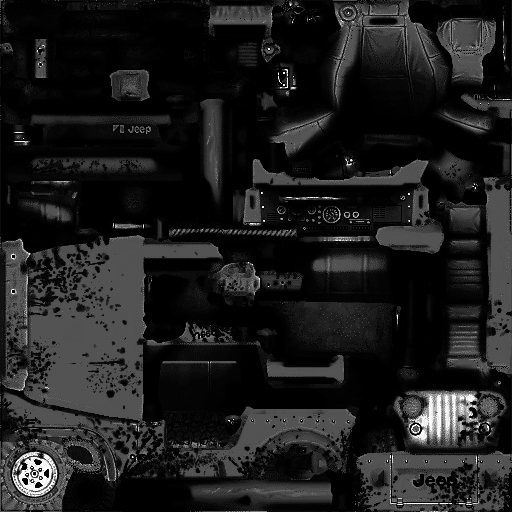 So I went for a single atlas texture with all the parts together and 8 bit quantization (256 colors). That's more in line with current texture compression techniques (like DXT1) where there is no global color constraint and you usually go for a single atlas. I might split and optimize my texture at some point to get the most out of the bandwidth and cache hits. Of course all has to be rendered @ 60 frames per second. Again, YouTube doesn't do justice to the smoothness of the animation. Also, it has been grabbed in interlaced mode because my grabbing hardware doesn't support 480p, so the actual quality is much higher than the one in the video. I added some full-screen AA and bloom to make it shine. There's a fixed cost for these effects and the jeep in itself doesn't cost as much as what can be seen in the video (rather around 5 ms in close-up). Thus AA and bloom cost won't be added twice when I'll place the jeep in the level. I've got plenty of headroom for a nice environment @ 60 FPS. Right now the animation is procedural. At some point, I'd like to set it up with dynamics so I can drive inside the map. That'll be for later if I can spend some time on it. Software used: Maya, 3dCoat, Lua, FreshEngine PSP. Hope you enjoyed it. As always, feel free to comment. nice presentation of the whole process involved. I like the pictorial presentation of the whole process. a student should be able to follow this with easy.